Anafi passenger and car ferry ticket prices, timetables, ticket reservations and information for ferries sailing from Anafi to Folegandros, Ios, Milos, Naxos, Paros, Piraeus, Santorini, Sikinos, Syros and Thirassia. Compare all available Anafi ferry ticket prices in real time and book the cheapest available Anafi car and passenger ferry tickets sailing to and from Anafi, Folegandros, Ios, Milos, Naxos, Paros, Piraeus, Santorini, Sikinos, Syros and Thirassia with LANE Sea Lines or ANEK ferries online with instant confirmation. Book Anafi Ferry Tickets with LANE Sea Lines or ANEK for ferries sailing from Anafi to Folegandros, Ios, Milos, Naxos, Paros, Piraeus, Santorini, Sikinos, Syros and Thirassia online in advance to enjoy the cheapest available ferry ticket price. The price you see is the price you pay. There are no hidden extras or surprises such as added fuel surcharges or booking fees and we do not charge you anything extra for paying with a Visa Electron card. The price we quote you for your selected Anafi passenger or car ferry ticket, onboard accommodation and vehicle type is all you will pay, and that's a promise. To obtain a Anafi ferry ticket price and book your ferry ticket securely online please use the real time ferry booking form on the left. You are also able to add a hotel at your destination, or anywhere else, to your ferry ticket when completing your ferry ticket reservation. Anafi is located at the southeastern edge of the Cyclades island complex, the nearest island is Santorini (Thera). It is administratively subject to the Cyclades Prefecture, and Thera province in particular. It has an area of 38.4 square kilometres, a coastline of 32.4 kilometres and a maximum altitude of 579 metres (Mount Vigla). The island's distance from Piraeus port is 155 nautical miles. Anafi island is at a far remove from the rapid pace of modern development, at the edge of the Cyclades, sobered by the Aegean sun and sea salt, isolated in its simplicity. Anafi is gradually claiming its stake on the tourism market. It is currently in a position to offer all necessary services to travellers, who do not arrive in Anafi as a regular tourist, but usually have all the characteristics of the explorers of old times, explorers of a virgin and unworldly landscape, discovered each time anew by land and by sea. Arrive at the port of Ai Nikolas and then head for Chora, the capital. The hill on which the ancient city was located extends to an altitude of 327 metres. Ruins of the asty, the Anafian city-state can be seen there, the city was probably established in the 8th century BC by Dorian colonists, and dominated island life until the end of antiquity. The city walls, as well as extensive ruins of the city’s cemetery, can be seen at Kastelli. Rich findings from the Roman period, during which the island flourished, are scattered throughout the area; one particularly impressive finding is the sarcophagus located next to the historic chapel of Panagia sto Dokari. The Monastery of Zoodochos Pigi or Panagia Kalamiotissa is located over the narrow isthmus separating the main island from the Kalamos peninsula. It is built over the eminent ancient temple of Apollo Aeglitis, which was linked to the asty by the paved Iera Odos (sections of which can still be seen today). Quite high sections of the walls of the temple itself , and its enclosure have been preserved, and incorporated into the enclosure of the modern-day Monastery. The Monastery has functioned as a pilgrimage since the times of Turkish rule, and is well-known both within and outside Anafi. The island's most important religious feast takes place there on September 7th-8th. The seventh and eighth of September are two special days for the island. This is when the feast of Panagia Kalamiotissa, the Madonna of Anafi, takes place. Preparations for the feast start days in advance, to make sure everything is ready on the big day. On the eve of the feast (September 7th), almost all the island's inhabitants used to gather their belongings and go to the monastery. It was like a mass house-moving event. Some went to the monastery by donkey or mule, but most of the villagers travelled there by fishing boat, if the south-westerly wind behaved. Usually, only the very elderly were left behind in Hora. The Panagia feast is a feast for everyone. The atmosphere was at once religious and filled with the expectancy of great celebrations. Dinner was served after the church service, this always included kid from the Monastery’s flock. Then it was time for the "tsambouna" bagpipe and for dancing. On the next day, September 8th, everyone would return to Hora after the church service, and the festivities would continue in the village. Besides the inhabitants of Anafi, the religious feast was also attended by many people from Santorini, who often come on a pilgrimage to Anafi’s monastery. The tall monolithic rock, inaccessible by sea and hard to reach by land, forms a unique natural monument for the island. It plays host to rare species of flora and has impressive geo-morphological features. The rock was inhabited, on an occasional basis, at least, in Medieval times, as a refuge from the island's numerous invaders. With an open view to the Cretan Sea, Chora is the only organized settlement, in the typical Cycladic style but with its own unique features. 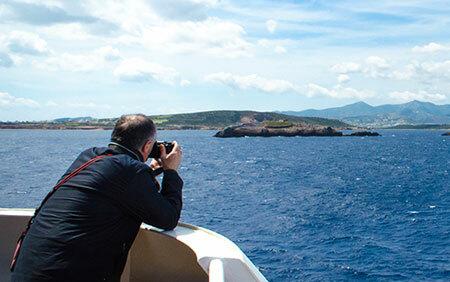 All excursions to the island’s “secret” and visible countryside start in Chora or the port. The nearby picturesque beach of Kleisidi with its few scattered homes, and the exotic beaches of Katsouni, Mikros and Megalos Roukounas, Megas Potamos, Aghioi Anargyroi, Prassies. Kastelli, a hill with ruins of an ancient city, and Katalymatsa, the site of the ancient Roman port. The Monastery of Zoodochos Pigi (Life-giving Source) or Panagia tis Kalamiotissas, a famous Anafian pilgrimage and patron of the island. The rough peninsula of Kalamos (altitude 459 metres), with the old Kalamiotissa Monastery at its peak. The village is densely populated and originates from medieval times. It is built amphitheatrically above the port, at an altitude of 260 metres. With 270 inhabitants today, Chora is distinguished from the capital of other Cycladic islands due to its numerous arched single-room homes, which occupy a large area of the settlement. Narrow cobbled streets criss-cross the village, leading to the Venetian Kastro (fortress), the initial nucleus and heart of the village. Several churches are scattered throughout Chora, including those of Agios Nikolaos, the Kimissi (Assumption), Agios Charalambos, Christos tou Stavrou (Christ of the Cross), Aghioi Anargyroi and Agios Georgios at the top of the Kastro, all with Byzantine or post-Byzantine icons.Findings from ancient Anafi can be viewed in the Archaeological Collection. Pedestrians and animals are free to wander around, as Chora, being a traditional settlement, is off-limits to vehicles. Various taverns, a rotisserie, a bakery, a grocery store and a bar are available to the local population and visitors. Accommodation is provided by several rooms to let. Best Price Guarantee - We always offer you our lowest available LANE Sea Lines or ANEK passenger and car ferries ticket price to and from Anafi. There are no hidden extras or surprises such as added fuel surcharges or booking fees and we also we do not charge you anything extra for paying with a Visa Electron card. The price we quote for your selected Anafi ferry ticket, onboard accommodation and vehicle type is all you will pay, and that's a promise! In the unlikely event you find the same all inclusive Anafi ferry ticket cheaper in the brochure of any other tour operator we promise that we will do our best to beat that price or offer you the choice of requesting a refund. To book Anafi car and passenger ferry tickets please click here. At ferryto.co.uk you are able to obtain live Anafi ferry ticket prices, check availability and book car and passenger ferry tickets to and from Anafi at our lowest available ticket price. Ferryto.co.uk is part of the world's largest online ferry ticket distribution network providing the ability to book over 80 major European ferry operators including to Anafi and to over 1,200 other ferry routes throughout the UK, France, Spain, Ireland, Holland, Eastern Europe, the Mediterranean, the Baltic and North Africa.